Children and their families are always welcome at the farm seven days a week. Parents and physicians alike say that they notice a positive change in the confidence, self-esteem and physical wellbeing of their newly noted cowboys and cowgirls. Having the ability to control an animal ten times their own weight and strength is not just a major accomplishment, but fun as well! Many of our young riders participate in horse-shows as well, winning several ribbons and gaining self confidence and tons of smiles. During medical treatments a family has no idea when a child will be well enough to come to farm, so Angel Heart Farm lets them make their own schedule. We are here for them 24 hours a day seven days a week. 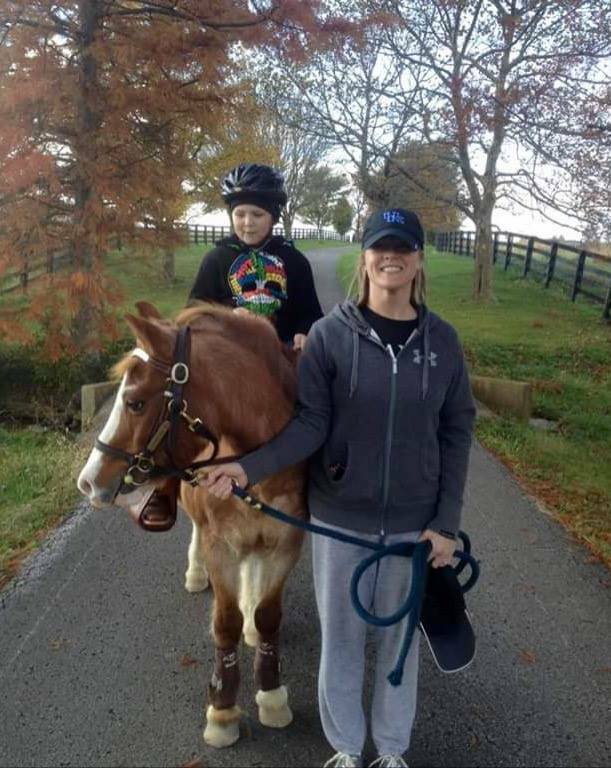 If a child is too ill to come to the barn, we will bring their favorite pony to them. Because families are faced with a multitude of unforeseen medical expenses, day care, travel expenses and other expenses, there are no fees for the program. Families estimate spending over $10,000 out of pocket expenses due to a childhood illness. Angel Heart Farm feels blessed to serve these families with a program that is free to them at a time when every penny counts. Angel Heart Farm operates year round with referrals coming from medical and social workprofessionals, as well as, other foundations such as The American Cancer Society, Make a Wish, Dream-makers, Cancer Free Kids, Jays Hope Foundation and several other organizations that serve our growing population of children with chronic and life threatening illnesses. After a child is referred to us, the family sets up a time for their first visit. Prior to their arrival a physician's form and information sheet is completed out along with the liability forms for each member participating in the program. We speak with the doctors about concerns and abilities each child has. The family is introduced to all the horses and ponies as well as introducing a volunteer that will work with them. All AHF volunteers are first aid/CPR trained and go through one-on-one training with Executive Director. Each volunteer must have strong equine knowledge and goes through a testing program to ensure they are exceptional candidates to work with our courageous children and families. All volunteers undergo a background check and must sign a liability form and confidentiality agreement. Our children's health and safety is the most important aspect of the program. When a family schedules a visit to the farm, it is their time; there is only one family on the farm at a time so that we can focus on individual families. This ensures the health of the ill child and creates a family bonding experience. A child may select any horse or pony they would like to work with. We teach the children to be caregivers instead of care recipients. They learn the proper way to brush and feed their new friend as well as how to ride. All of Angel Heart Farm's equine are former show horses and do daily training to ensure the safety and soundness of each horse/pony for the children and families. Many of our children have gone on to compete at horse shows, winning ribbons and developing great confidence. We encourage families to bond together using our horses and ponies as tools to communicate and relax together as a family. The family has no time limit placed on their visit, and we encourage families to visit as often as they wish. Several of our children continue to participate in the program after they have completed their treatments and siblings still come after the loss of a sister or brother. Our commitment to families is now and into their futures. AHF offers two camps each summer in conjunction with children's regular lesson program. Pony Princess Camp is a one week day camp filled with ride time, bonding and making new friends with children who are experiencing the same type of health issues, arts and crafts and a horse costume finale and parade for parents, family and friends. Cowboys Only Camp is a day camp where boys get to be full fledge cowboys! Real cowboys teach children the art of calf roping and riding as well as arts and crafts all geared in the cowboy traditions. Angel Heart Farm is proud to work with the following organizations. Community service is a big part of Angel Heart Farm. We implement projects with our miniature horse at local, educating area children about horses and literacy. Our miniature horse also visits nursing home facilities, The Hope Lodge (American Cancer Society), Ronald McDonald House and participate in Hospital events, Survivorship days, Cancer Free Kids Butterfly walk and several other community awareness events.